to achieve the portion and serving sizes desired. Features large LCD with custom display legends, protective Hard Case plus soft plastic cover to protect keys during use, two (LR43) Long-Life Batteries, easy-to-follow User's Guide and Full One-Year Limited Warranty. Professional Recipe Conversion Calculator with two Digital Timers - Countertop model. Easily and accurately adjusts recipe ingredients up or down to achieve the portion and serving sizes desired. Features Jumbo LCD with Multi-position tilt display, soft plastic cover to protect keys during use and allow for easy cleaning, one (CR-2032) Long-Life Battery, easy-to-follow User's Guide and Full One-Year Limited Warranty. The most useful food prep tool just got better. Cuisinart's® Mini-Prep® Plus Processor now features a larger 3-cup bowl with a convenient handle. The auto-reversing SmartPower™ Blade feature and chop/grind touchpad control allows you to chop or grind ingredients instantly at the touch of a button. With its powerful 220 watt motor and supersized beaters, the Cuisinart® Smart Power™ 5-Speed Chrome Electronic Hand Mixer makes fast work of heavy tasks. The Cuisinart™ Electric Knife not only delivers high performance and great satisfaction, but is also a counter top space saver. The Cuisinart™ Electric Knife is backed by a three-year limited warranty. Cuisinart® continues its commitment to superior quality and innovation with the new state of the art electric stainless steel knife. 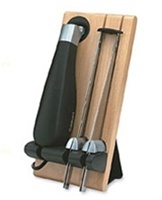 Complete with two stainless steel blades ideal for slicing meats, loaves, and vegetables. Whatever your style, the Cuisinart® Automatic Frozen Yogurt-Ice Cream & Sorbet Maker will help make a delicious frozen dessert to match it! Fat-free sorbets, low-fat frozen yogurts, rich ice creams - up to 1-1/2 quarts - quick and easy! Cuisinart engineering simplifies the art of baking the perfect pizzelle. The Cuisinart® Pizzelle Press makes two thin, crisp 4-inch cookies at once. Dual indicator lights provide easy operation and take the guesswork out of timing. Pizzelle can be baked at one of 5 browning levels. Nonstick plates let consumers remove warm pizzelle without breaking them, so they can be rolled for cannolis or cones. Plates wipe clean with a damp cloth, and the unit stands up for compact storage. 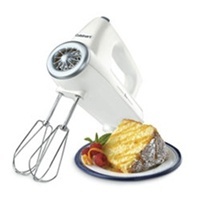 220 watts of power enables you to mix double batches of cookies without bogging down. Spice up the variety in your kitchen with this 3 piece Specialty Disc Set. Powerful 500 Watt motor crushes ice instantly with no liquid added. 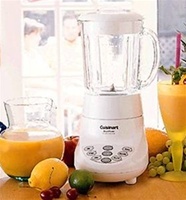 It blends, purées, chops, mixes, and liquefies all with the push of a button! 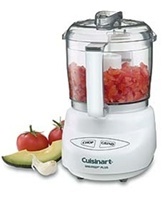 This very smart and versatile SmartPower™ 7-Speed Electronic Blender has enough power and speeds to do it all. 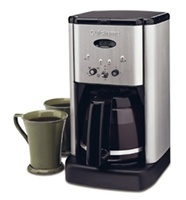 Introducing an evolutionary new look in coffeemakers. The Cuisinart®® Brew Central™ Coffeemaker makes a bold design statement with a brushed stainless steel finish, and switches in an elegant tech-industrial design. Programmable from start to finish, with a variable heater plate for temperature control, it's the ideal coffeemaker for today's demanding consumer. 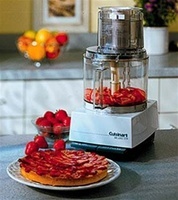 Leave it to the leader to bring food processor technology to new heights! 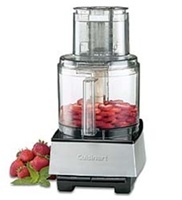 From the Cuisinart® Pro Custom 11™ Food Processor's exclusive cover with large feed tube and unique compact chopping/kneading cover, to its industrial quality motor, this powerhouse is built for convenience and many years of use. 11-cup capacity Lexan® Work Bowl - shatterproof, heat and cold-resistant. 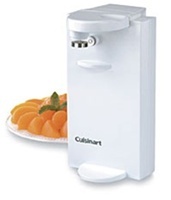 Cover with extra large feed tube allows slicing/shredding of whole fruits and vegetables. Stainless steel chopping/mixing blade chops large batches or a single garlic clove. Dough blade kneads 3 lbs. of dough in less than two minutes. Three-year limited entire unit warranty. The easy to use, large capacity Custom 14™ Food Processor speeds-up all your cooking - from quick weeknight meals to weekend celebrations. 14-cup capacity Lexan® Work Bowl - shatterproof, heat and cold-resistant. Stainless Steel Medium Slicing Disc (4mm). Detachable disc stem provides compact storage.